There are four major individual player awards presented by the WCHA each year. Three of them are going to Northern Michigan this time around. 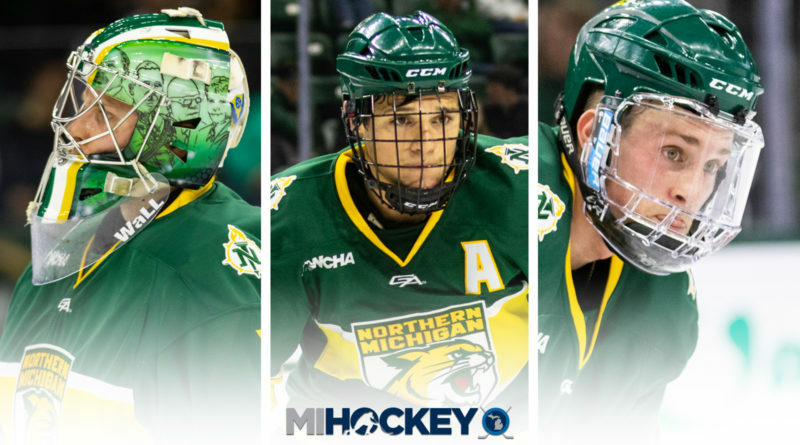 Troy Loggins, Philip Beaulieu and Atte Tolvanen have all been honored by the conference, the WCHA announced today. Loggins has been named the offensive player of the year, after racking up 32 points in 28 league games. In total, the Huntington Beach, Calif., native recorded 40 points in 39 games. He was a two-time First Team All-WCHA selection during his time in Marquette. Beaulieu has been named the defenseman of the year after leading all WCHA blueliners with 28 points in league play (he finished with 35 in total). The Duluth, Minn., native earned All-WCHA honors for the second time in his career this year, and he was the conference’s defenseman of the week three times. Tolvanen was named the goaltender of the year for the second straight season, after he led the WCHA in wins (18), shutouts (five), saves (699), shots faced (754)…and goals by a goaltender (had to add that one in there). The native of Vihti, Finland, ends his NMU career as the all-time leader in shutouts (13), games played (137) and saves (3,564). He also holds the school single-game record for saves with 58.